Back for more movie magic, the Rugrats descend on France in "Rugrats in Paris - The Movie", with toys that bring together both new characters and returning favorites, including Sing & Swing Angelica and Bounce 'N Babble Dil feature dolls from Mattel and a new line of movie-based video games from THQ. 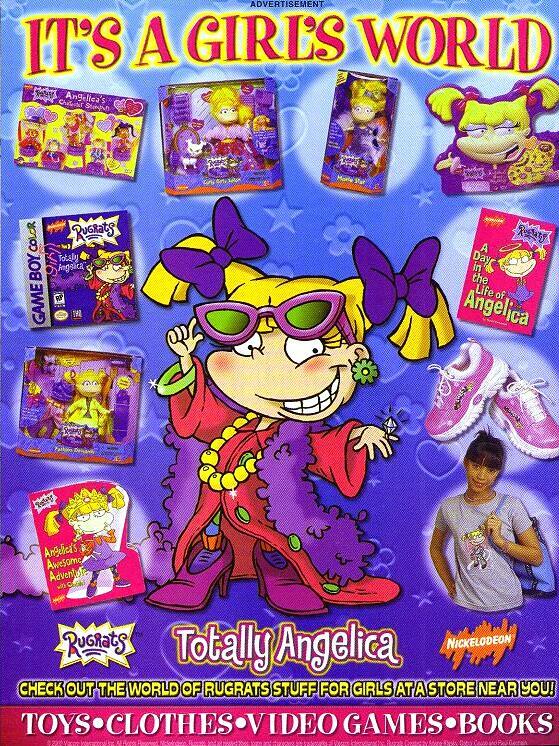 And as this billion-dollar franchise continues to evolve into an evergreen property, it will branch into new areas, including "Totally Angelica," a new girl-targeted fashion and glamour play line with an over-the-top attitude featuring products such as dolls and playsets from Mattel and Angelica Fashion Activity kits from Flying Colors Toys, with body art, hair ware and more. In addition to the above, Burger King will once again promote the Rugrats. For details, click here. Most movie-goers will receive special collectable passports, with an opportunity to collect passport stamps by buying their favorite products, possibly leading to a family trip to Paris. For more information on the passport promotion, plus additional promotions, click here. The Rugrats Still "Got Milk"
America's dairy industry is freaturing the Rugrats in another Got Milk? mustache campaign, just in time for the movie. For details, click here. The Rugrats' second cereal -- Rugrats In Paris Cereal, has hit the shelves of supermarkets everywhere; it'll be sold October to December 2000. For more details, visit the cereal page. Stay Tuned For "Hogan's Rugrats"
These promotions are not just limited to the movie theater or the supermarket -- even Nick-At-Nite and TV Land are getting into the act, in the form of marathons of classic TV hits. 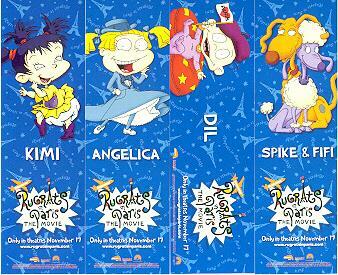 On Friday 11/10/2000, there was a 2-hour "Brat Pack" marathon, featuring an hour of Rugrats featuring Angelica, along with 2 episodes of The Facts Of Life, featuring Lisa Whelchel as Blair Warner. And over on TV Land on Thursday 11/16/2000 is TV Land Goes to Paris, a 4-hour marathon featuring Paris-oriented episodes of I Dream Of Jeannie, Bewitched, I Love Lucy, Hogan's Heroes and of course, The Facts Of Life, all in promotion of Rugrats In Paris. There are other special promotions planned for the new film, some for movie goers, some for theater employees, and even one for cable companies. NEW YORK, NEW YORK, October 2, 2000 - In an innovative multi-tiered sales promotion, Showtime Networks Inc. and Nickelodeon are harnessing the power of the upcoming Paramount Pictures / Nickelodeon Movies new film "Rugrats In Paris" to help boost subscriptions of basic cable and SHOWTIME upgrades this fall while also building excitement for the film's November 17th theatrical release. Showtime Networks, Nickelodeon and Paramount are teaming up for a high-impact sales campaign, scheduled for October 2 through December 31, 2000. The promotion centers on an informational direct-mail campaign that will provide consumers with an "instant-win" free 17" x 22" exclusive poster from the new film. As an added-value incentive, cable customers who sign up for SHOWTIME during the promotional period will be entitled to receive a free limited-edition CD sampler of songs from the film (a $10.00 value) when they send their first two monthly cable bills to Showtime. "With this promotion, we're capitalizing on the tremendous brand awareness of the Rugrats family franchise to call attention to the many exciting family viewing choices available on cable TV, including SHOWTIME's acclaimed lineup of family-oriented programming, which earned us 21 Daytime Emmy nominations last year, as well as NICKELODEON's full range of children-oriented programs," noted Gina Goldberg, Showtime Senior Vice President of Marketing. "It's a great way for us to help our cable affiliates build their business while giving us the opportunity to promote our exciting programming lineup using the proven popularity of Rugrats." In addition to the direct-mail campaign, the promotion will be supported through telemarketing, cross-channel local TV spots as well as radio spots and point-of-sale materials. To help motivate affiliates to drive sales and support the Rugrats film, Showtime will provide a variety of incentive options and premiums. Among these will be a Grand Prize trip to Orlando for a family or group of 4, including airfare, hotel, admission to Universal Studios, a VIP tour of Nick Studios and spending money which will be offered to each sales region participating in this promotion. Other incentives include a supply of free "Rugrats in Paris" tickets for each region, redeemable at participating movie theater chains. 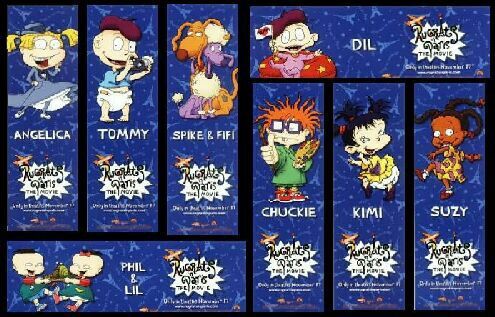 PARAMOUNT PICTURES AND NICKELODEON MOVIES LAUNCH BIGGEST IN-THEATER PROMOTION EVER FOR "RUGRATS IN PARIS - THE MOVIE"
Included in the promotional campaign are lobby displays, media, cross promotions and exciting prizes for theater managers. These include trips to Paris, New Orleans, Las Vegas and Orlando; home entertainment systems; DVD players; digital cameras; large-screen TVs; and cash prizes up to $75,000. In addition, exhibitors will be utilizing in-theater displays highlighting the unprecedented Passport Promotion. Over 2,200 theaters will participate in a first of its kind promotional lobby banner contest. The theaters will be provided with a special 12' x 10' banner to hang in their lobbies. Fun-filled games and prizes will be awarded to customers who find the hidden items in a huge painting of the Rugrats characters. Coca-Cola, which is providing Rugrats-themed kids' trays for theater refreshments (left). Dolby Digital, represented by Rugrats balloons branded with the Dolby logo and by a Dolby Digital trailer on a looped video reel. JBL, which will promote its systems with over-sized balloons and lobby displays of its home cinema systems. In addition, JBL is offering home entertainment systems as manager incentive prizes. Kodak, which is providing lobby materials and one-time-use cameras as customer prizes to promote its Kodak ScreenCheck quality control program. Landoll's, creator of children's activity books, which has produced a coloring stat of Rugrats characters that exhibitors can distribute at the theater and to local promotional partners. 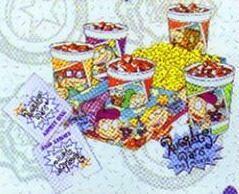 Mattel, which is one of four companies offering prizes in the Rugrats Lobby Banner Contest. Maverick Recording Company, which is releasing the "Rugrats in Paris" soundtrack album, is participating in the Lobby Banner Contest. The soundtrack will given away and played on lobby sound systems. Nickelodeon, which is providing mobiles with adaptable cable affiliate logo stickers and looped VHS tapes for in-theater displays featuring highlight clips, behind-the-scenes footage and music videos. Noggin, a joint venture between Nickelodeon and Sesame Workshop, which will provide rub-on tattoos for in-theater giveaways and Etch-A-Sketch toys for prizes. Oral-B, which has created a "Rugrats in Paris" toothbrush/toothpaste kit with coloring book and crayons. Oral-B is part of the Lobby Banner Contest. Post Cereals, which is offering free child admissions on specially marked boxes of cereal through its Hollywood Movie Magic program. Simon Spotlight Books, a division of Simon & Schuster, which is the publisher of the Rugrats in Paris books, will be represented by a kid-sized standee and by copies of its books in lobbies. THQ / Sony Playstation, which has produced "Rugrats in Paris"-themed game certificates for its Playstation® game console. Sony Playstation is also taking part in the Lobby Banner Contest. 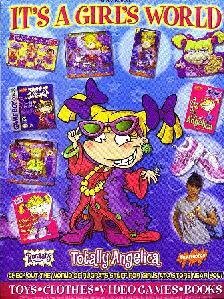 Around the world, companies in other countries will be using their brands and products to promote Rugrats In Paris, as the film's released internationally during 2001. Sponsors include Kraft in Canada (which sponsored a passport sweepstakes); Kellogg's in France; Weetabix in Britain; Uncle Toby's Fruit Snacks and Hungry Jack's in Australia; and Central Impulsora in Mexico (makers of Bimbo bread). Weetabix, AOL UK and gift retailer Clintons are to promote the release of the second Rugrats movie. AOL UK will distribute free CDs in Asda stores throughout the UK featuring a trailer of the movie, games and a free 90-hour trial of the AOL service. Weetabix is to insert Rugrats pencil grippers into packets of Weetos, backed by a national TV and cinema advertising campaign to coincide with the movie's UK launch. Rugrats toys, produced by Vivid Imaginations, will be distributed through Clintons stores. "We are delighted to be working with these key family brands on behalf of our newest Rugrats movie," said Benvon Crumpler, marketing director at Nickelodeon International.